Eager churchgoers entering Denton Bible Church on a late summer Sunday were greeted by the toothy grins of extinct dragons. Why would a church display giant dinosaur fossils and offer an education series on these "mythical" monsters? Because dinosaurs are often a stumbling block for Christians trying to understand how science and the Bible fit together. On August 21, 2016, over 5,000 North Texans gathered for the first session of a weekly creation seminar series led by ICR experts. 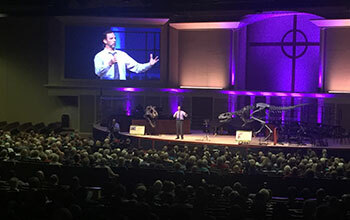 Astrophysicist and apologist Dr. Jason Lisle presented about origins and the relevance of Genesis. Our understanding of origins makes a vital difference in our understanding of how we live, who (or what) we worship, and how we relate to people and life circumstances. ICR's fossil walk was a highlight for both children and adults. Over 1,000 people funneled through the sanctuary and hallways to learn from ICR experts about science, geology, and the recent origin and extinction of dinosaur kinds. Several attendees took to Facebook after their tour to post ecstatic reviews. 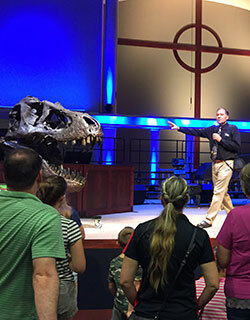 Heidi S. said, "Our family thoroughly enjoyed the dinosaur tour at Denton Bible today! Thanks y'all!" Science writer Brian Thomas recently visited the Field Museum in Chicago to see Sue—the famous T. rex fossil. During his visit, he noticed an excited 8-year-old boy making a beeline for the "dinosaur times" exhibits. Most students are only taught about the "age of reptiles," but how does this reconcile with real science and biblical history? On August 22, Mr. Thomas delivered five dinosaur details that confirm a recent origin of these "ancient" creatures. Brian's humorous presentation and fascinating facts from biology, dragon legends, and biblical history engaged the audience in laughter and amazement. The crowd participated by repeating several tongue-tying dinosaur names. Can you say Pachycephalosaurus? At the end of the presentation, Pastor Charles Stolfus facilitated an audience-driven Q&A session. Attendees asked questions about dragon myths, soft tissues in fossils, and college evangelism. The final question elicited an audible reaction from the audience: "How do I share what I learned tonight with my pastor who believes in billions of years?" How would you respond? Many people use astronomy to challenge Scripture, but what do the heavens actually reveal? On August 29, Dr. Lisle took the audience on a tour through the cosmos, revealing how the universe declares the glory of God and how the Bible is right when it talks about the basics of astronomy. When we really understand the Bible and the universe, we find that the scientific evidence lines up with Scripture. From our beautiful blue planet and blazingly brilliant sun to the farthest stars of the universe, God's invisible attributes and awe-inspiring design in creation are "clearly seen." When it comes to astronomy, the Bible is right! It's not too late to participate in this dynamic education series. Join us at Denton Bible Church (or online via livestream) for two more sessions. On September 12, Mr. Frank Sherwin will present Scientific Evidence for Creation. On September 19, Our CEO Dr. Henry Morris III will close the series with The Book of Beginnings. We will release some of these talks as high-definition DVDs, available soon at our online store. And we're also releasing our exciting four-episode dinosaur series Uncovering the Truth about Dinosaurs this November! Be on the lookout for these new resources. Seminars at churches are a great way to impact communities. We have enjoyed partnering with Denton Bible Church to equip Christians with answers to common questions of faith and science—as we have done across the USA and internationally for the last 45 years. Soon we hope to begin building the ICR Discovery Center for Science and Earth History. It will combine cutting-edge science with cutting-edge technology for an immersive experience that shows God's handiwork all throughout the universe. Can you imagine how many lives will be changed? Prayerfully consider how you can partner with us in this exciting project that will unlock the mysteries of Genesis for generations to come. *Michael Hansen is Executive Assistant to the CEO at the Institute for Creation Research.